Writing aRound and a Giveaway! Another idea to play with the round theme before the month is up is to gather with a few friends (or do this via email) and write in a round. You could each write a line (or paragraph) of a story (or poem) before passing it to the next and marvel at where it goes! I once did this idea with 5 canvases and 5 friends. Each person started a canvas and played with it for about 30 minutes before passing it on to the next person. We worked on the canvases throughout the day, eventually ending up with the canvas we started with, an original piece of art touched by many hands. So fun! 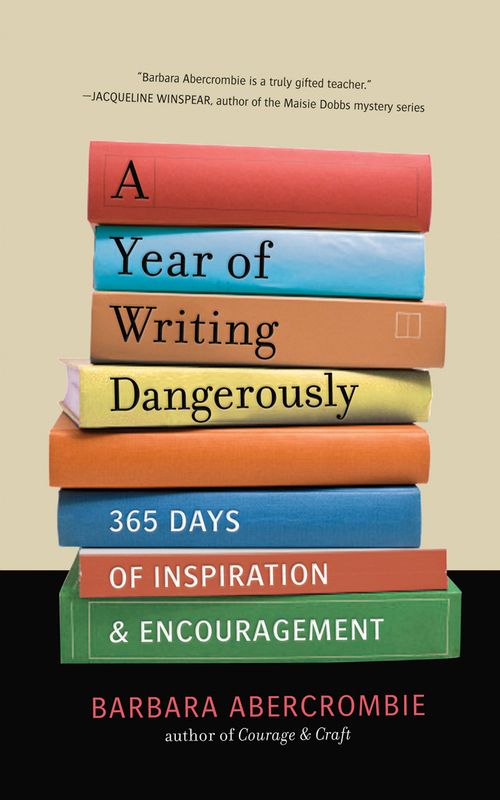 There are loads of fun ideas, prompts and inspiring tidbits in A Year of Writing Dangerously by Barbara Abercrombie. A great style for writers looking for daily inspiration, the book has 365 short essays, a bit of inspiration for each day of the year. And at the book there is a list of 52 writing prompts, one for each week of the year. If you're feeling stuck or unsure where to begin, this book will surely give you something to run with. One of the suggestions that reminded me of the circular theme this month was day 29, titled "First things first." The author mentions writer, John Irving, who writes his last sentence first. That blew my mind! But what a great idea, to start with the ending and then work your way back to it. Would you like a copy of A Year of Living Dangerously? Simply leave a comment (make sure to include your email address, so I can contact you) and I'll select a winner by Friday, July 27th. Good luck! Update: We have a winner! Congrats to Becky! What a great idea! I wrote a short story several years ago with a large group online, and I think we had about 28 chapters in all before the ending – it took a lot of loops and turns and wound up being a really fun exercise. I can use any help I can get to get back in the writing space…thanks for this giveaway! This book sounds great. Thank you! This is a great idea, Leah, and the book sounds great! I love the idea of creating in the round. Used to play a game in the car with my children where we created a story with each person contributing a sentence in turn. Lots of fun and many laughs. I’m a fan of creativity in all forms and would love to read this book. Thanks for the giveaway opportunity. What an awesome book. I love to write, but so often get stuck. Thank you for introducing the book. It sounds terrific. Writing has always appealed to me but I just never know what to write, so ideas and inspirations would be fab! As a writer the thought of writing the last sentence of a novel intrigues me. Perhaps the next flash fiction I write I’ll start from the end and work my way back! Thanks for the creative inspiration, you ROCK leah! I would love this book. I have done some similar writing exercises with my son. One of us writes a few paragraphs and sends it on to the other who then writes a few paragraphs and back and forth. Very freeing to just write what is in your head at the moment, with no end results in mind. I’ve also done this with art journals as well. Pass them on from one person to the next and to the next and it is so much fun! I haven’t done any art this way – sounds like fun though – but I have been part of a group who wrote a story this way and I loved the experience. The only time i ever participated in a creative round of any kind was in a women’s spiritual group when I lived in Minneapolis. Someone found an excellent walking stick and we passed it around every week and each one of the dozen women added something creative/artistic/symbolic to the stick. After it had made the artistic round we still continued to pass it around each week. The group disbanded in the late 90s. I wonder who ended up with the walking stick? I had forgotten about it until now. Please add me to the drawing. Sounds like a wonderful book. Leah, Thanks for this great idea–and the giveaway contest! I’ve been frustrated with the lack of creativity in my day job, and I think I’ve come up with a way to use this idea with my two colleagues in my department! We’ll see how it works, but at least I’ll try. Looks like a great inspirational book! Great giveaway! Throw my name in the hat! Thanks! thank you for your generous book givaway. i did the second to last chapter of a book we wrote in creative writting awhile back . i chose Chapter 11 so i could tie up the characters and twist the plot a bit. also have done round robins with fabric art folk. what a great prompt! What a great idea for a book! It would definitely help me to get back into writing mode. What a delicious idea, for a writing or an art project!…The book looks tantalizing! Gosh, can you tell I’m hungry?….At any rate, do include me in the giveaway…the book looks like a wonderful creative burst of energy to get one going! I love the idea of writing the last line first. Never thought of doing that. I’m gonna try it just for fun! Thanks for the inspiration! Oh, I love the idea of creating in a round! I’m sure I’ll end up using the idea of writing in a round one of these days. I think I’d do it the way you did it with your group of friends and the 5 canvases: with everyone having bits and pieces of the previous stories they’d have worked on in mind, the experience and the end results would be extra interesting! That book sounds great, and really inspiring – and I could certainly make use of that inspiration… Thank you for offering us a chance at winning a copy of it! Hi Leah! I haven’t been to visit in forever! Funny that I have gone back to writing again as well as still doing my art. Did some texture art that I love! Will write more on my blog about it later. I would like to enter your contest here. Can’t wait to catch up on your blog! Looks like a good source of inspiration–something we all need! Thanks for hosting the giveaway. I love the idea of collaborative work, be it a circle journal, a hooked rug, or shared canvases. Seeing the results of shared creativity is always such a joy! I just started the Creative Every Day challenge. Happy to be part of this. I’ll probably be mostly crafting stuff, but a writing prompt every day? Why not! Writing is fun too. Love that you can mix it up with this challenge. Thanks for organizing this! Thanks for nurturing my creativity! I would love the book. Peace, caranjoseph@me.com. I like the idea of starting with the ending first. I suppose knowing where it will all leads, somehow gets you to write the beginning. maybe. I journal every day in books I have made myself. This book seems right up my alley!!! If I don’t win it, maybe it has a Kindle edition!!!! Hi Leah! The book arrived on Monday! Thank you!!! I have started a poetry round thingie where I throw out a line or two, my artistic and poetic friends have blessed me with their wonderful words, lines and complete poems! They are making me look bad! LOL But I am so loving this idea. I may set up a poetry blog. Just think… YOU helped inspire this! Awesome! Thanks again, Leah.